I struggled with this review, much like I now do trying to wedge my behemoth bellies (yes, plural tense) into my high school?era Levi’s 501 and FU’s denim slacks. The struggle I faced with the Halford show was not girth? but quality?related. Certain parts of the show I had anxiously awaited for weeks left me scratching my balding head while others left me shrugging my hairy shoulders wanting more, like how I feel after eating a rice cake or a few salt and vinegar potato chips. 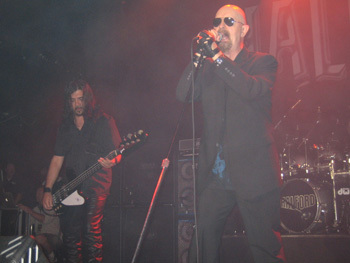 I desperately wanted to write an undisputed glowing review reflecting a flawless show like many I have witnessed Rob Halford (“RH”) perform. The show overall was good. However, I would be doing a disservice to readers if I did not also include some criticism. 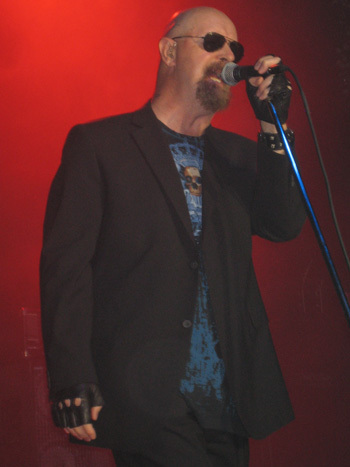 I should profess Judas Priest (British heavy metal band for whom RH has served as vocalist for 28 years) is my favorite band, a band I have seen live numerous times dating back nearly 25 years with each show further cementing the band’s legacy in the annals of metaldom. The mighty Priest’s Defenders of the Faith (1984) and Painkiller (1990) records are molten works of genius that make most others bands sound like Alvin and the Chipmunks (animated music group created by Ross Bagdasarian, Sr. (1958)). I also profess that Ronnie James Dio’s (late Black Sabbath, Rainbow, Dio vocalist) recent untimely death means RH is now my favorite living singer. 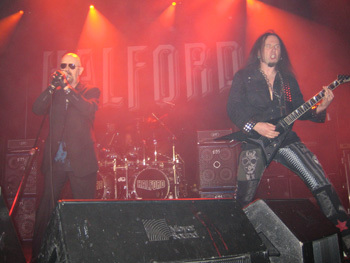 Halford undeniably sounded polished due to rigorous rehearsals. With that said, the faux pas I observed are uncharacteristic for a veteran entertainer of RH’s caliber. Now on to the show. 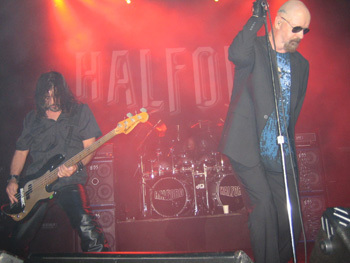 On Saturday, July 17, 2010 Halford played a warm?up show at San Francisco’s 1,050?seat capacity Regency Ballroom (RB) that was two?thirds full (approximations presumed throughout). 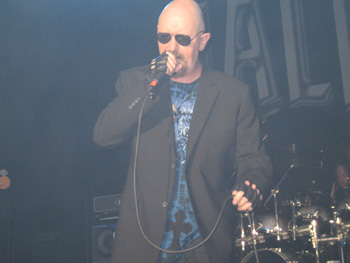 Halford played a 13?song, 70-minute set from 10:10 to 11:20. Halford’s logic in playing a limited 70?minute set as the headliner puzzled and disappointed me. 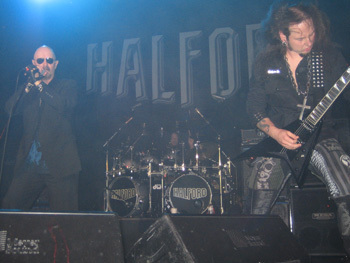 Before this show Halford had not performed live in over seven years (last prior show being Anaheim, California (06-06-03)). 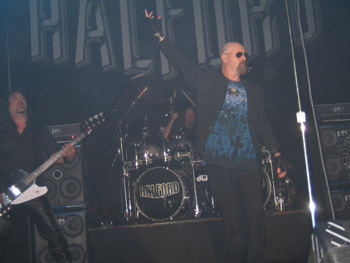 Halford should have been chomping at the bit get on stage and prove it still has the same menacing edge and lethal quality it possessed as an actively touring band around the time of the release of the Resurrection (2000) and Crucible (2002) records. 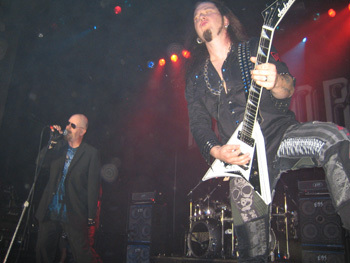 Additionally, this was a warm?up show intended to hone Halford’s musical chops in preparation for participation on the eight?date Ozzfest tour bill commencing August 14, 2010. A warm?up show is an opportunity for a band to play more songs than a standard set to gauge what songs do and do not work in a live setting. The results permit a band to parse down the set list in time for future dates. “Warm-up” is not intended to be construed literally to mean the band only spends enough time on stage to get “warmed up,” and a warm-up show is not supposed to feel like an extended sound check, which this show did. By comparison, Kiss played 27 songs during its warm?up show for the Revenge tour (Allentown, Pennsylvania (10?01?92)). Further, more observant fans expected a longer set because the set times posted at RB’s entranceway listed a 90?minute set. 1. Silent Screams (Resurrection record, 2000). 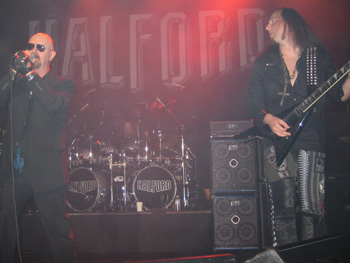 The red stage lights illuminated the “Halford” logo comprised of silver lettering against a black background, creating a deep crimson color. 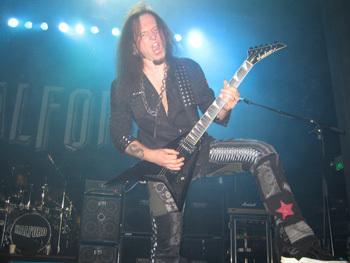 RH casually walked on stage and said, “Hello San Francisco.” RH wore (1) black combat boots, (2) black wool slacks, (3) Metal God Apparel (RH merchandising brand) Steel Wings blue on black?colored background t-shirt with five skeleton skulls atop a crowned pair of wings and above the “Metal God” chest?level logo, (4) black wool blazer, (5) fingerless black leather gloves, (6) black studded leather bracelets on both wrists, and (7) black pilot sunglasses. RH’s decision to wear black wool slacks and blazer surprised me. 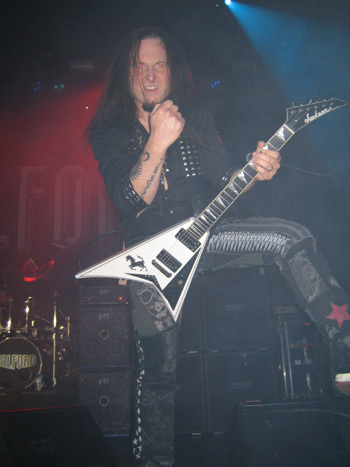 RH is the metal god, the revolutionary, iconic metal singer who wore head to toe studs and leather in the 1970’s long before it became standard metal regalia. [Admittedly RH wore studded leather bracelets but the blazer and slacks made him look less like the metal god and more like Jackson Browne (American album?oriented rock singer who writes politically?charged songs).] 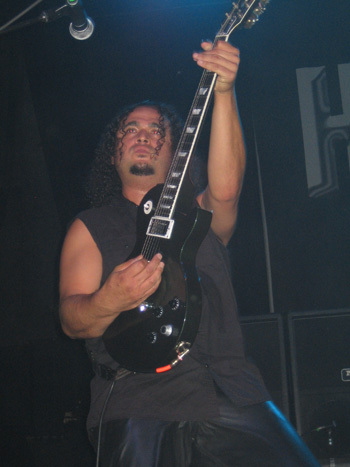 Silent Screams is a slow tempo song that began with “Metal” Mike Chlasciak (“MC,” guitarist) and Roy Z’s (aka Roy Ramirez’s) (“RR,” guitarist) melodic guitar notes they played on their black Jackson flying V and maple Gibson Les Paul guitars, respectively. Shortly before RH began to sing the first verse Mike Davis (“MD,” bassist) played subtle bass notes on his black Gibson Thunderbird bass. Bobby Jarzombek’s (“BJ’s,” drummer) subtle beats on his snare drum served as the introduction to the second verse. MC and RR’s heavy guitar chord progressions and BJ’s solid drum beats served as the introduction to the first chorus. 4. Made in Hell (Resurrection, 2000) is an up tempo anthem that began with MC and RR’s guitar chord progressions and BZ’s solid drum beats. Shortly after MC played a guitar run RH sang the first and second verses followed by the first catchy chorus during which the audience participated by four times chanting “hell,” “Hell, we’re born to raise some hell. Hell, we’re gonna raise some hell.” RH then sang the third and fourth verses followed by the second chorus. The song’s harmonic structure then changed and the tempo slightly slowed down when RH sang the two?line bridge. MC and RR played 40?second (combined) guitar solos for after which the tempo resumed its initial up tempo pace and RH sang the fifth verse and third chorus. 5. Never Again (Fight cover: A Small Deadly Space, 1995) presented a dichotomy because RH sang at a fairly slow tempo (yet high octave) while MC, RR, BJ, and MD played their instruments in an up tempo style. RH sang the first verse and chorus, slightly increasing the tempo during the chorus, while MC and RR played up tempo staccato guitar riffs. 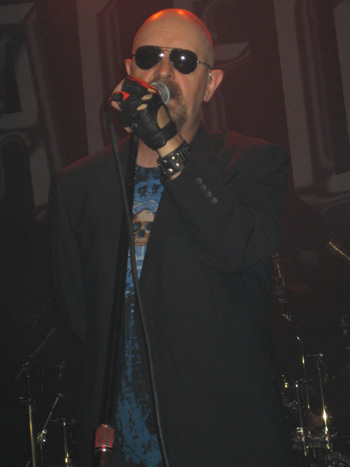 RH, who was no longer wearing his jacket or sunglasses, clutched his microphone (“mike”) in the stand with both hands and slightly swayed left and right. RH then sang the second verse, second chorus, and bridge followed by MC and RR’s 40?second (combined) guitar solos. RH then sang the third verse and chorus. The song ended with the bridge section. 6. Drop Out (Metal God Essentials Vol. 1, 2007) began with four bars of MC and RR’s churning guitar riffs that they followed with chugging up tempo guitar riffs augmented by BJ’s driving drum beats. RH sang the first verse with his left arm behind his back and in an “atmospheric” tone suited for the lyrical content, “I like to lose my mind and fly off into space. Why don’t you come with me you’ll leave without a trace. I’ve got the magic that will open up your head. Tune in, turn on, drop out … just like the wizard said.” [I am not sure what inspired RH to write such lyrics, but mushrooms, acid, and ganja may have been on the menu at the time of authorship.] RH then sang the first chorus with his eyes closed and slightly greater grit in his voice. RH repeated the pattern from the first verse and chorus when he sang the second verse and chorus. BJ then pummeled his tom?toms at a frenetic pace for 10-seconds while MC played a searing guitar solo with wah?wah effect on his white Jackson flying V guitar. The tempo adopted a mid tempo pace for 30 seconds but resumed an up tempo pace for RH to sing the third verse and chorus. 7. Golgotha (Crucible, 2002). 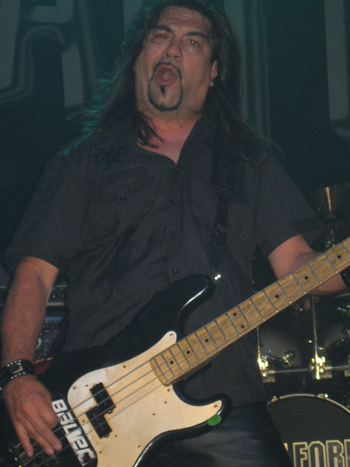 Before Golgotha RH walked to the front edge of stage left where he shook and slapped hands with front row fans. Golgotha is a slow/mid tempo rocker. [Referring to Golgotha as a slow/mid tempo song is deceiving because it was heavy enough to leave me slack?jawed.] RH chanted the first verse atop MC, RR, and MD’s heavy riffs, “Golgotha! Rise up from your tomb. Devil’s had a taste of holy water. Lost children need your guiding hand. Take them through the fire of the promised land.” [Lyrics ripe for the soundtrack of next film in the Richard Donner British/American suspense/horror film series, “The Omen.”] MC, RR, and MD’s guitar and bass riffs were so heavy BJ’s drum beats were lost in the mix. RH then transitioned to the first chorus, which he sang with less gusto and more melody. After a 10?second interlude featuring MC, RR, and MD’s heavy riffs augmented by BJ’s snare drums, RH repeated the pattern from the first verse and chorus when he sang the second verse and chorus. RH sang the second verse with vigor while clutching the mike stand with both hands. MC and RR then played lingering power chords that converted the song to an up tempo pace replete with frenetic riffs and BJ’s thundering tom?toms. 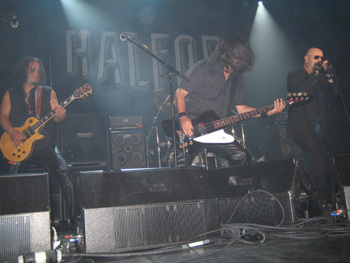 BJ played a grey?to?black fade Pearl drum kit, double bass drums, Paiste cymbals, and the drum heads featured the silver Halford logo against a black background. I am not sure what BJ wore because my vision was obstructed by his Herculean drum set. The up tempo pace that bordered on thrash carried into the third verse as RH sang at a fast pace amidst red and blue stage lights with his right arm behind his back as he rocked back and forth, “Overcoming tyranny to desecrate the entity … satanical. Laying waste this sick disease … that crippled, maimed, feel to our knees … like Jericho.” [RH’s physical posture reflected a medieval warrior psyching himself for a blood?filled battle.] MC played a 10?second guitar solo followed by RH screaming the fourth verse, “Pile of skulls crunched under foot. Torched remains are crying out … satanical. Rising up to purge and scourge the killing of our paradise … like Jericho.” MC then played a 15?second guitar solo followed by RH twice singing the one?word pre?chorus still at a fast tempo, “Salvation.” The tempo resumed its initial mid tempo pace when RH sang the third and final chorus. Golgotha, Resurrection, and another song to be performed received the strongest audience reaction. 8. Heart of A Lion (Live Insurrection, 2001) is a fairly slow tempo rocker that began amidst MC and RR’s basic guitar chord progressions and BJ’s basic drum beat. 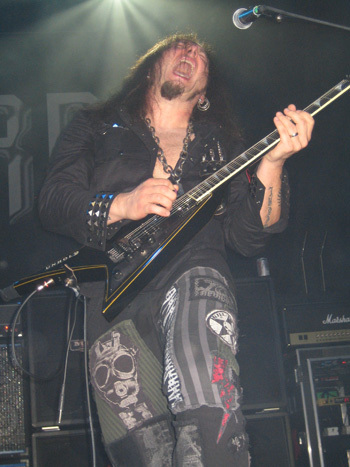 RH sang the first two verses in a melodic tone atop MC and RR’s melodic guitar chord progressions they played on their black Jackson flying V and black Gibson flying V guitars, respectively. MC and RR’s guitar chord progressions were a bit too sugar?coated for my taste, but compensated for by the memorable fiery guitar notes they played between the first two verses. RH then sang the first chorus, third verse, fourth verse, and second chorus, screaming the word “heart” during the choruses. RH then sang the fifth verse followed by MC and RR’s 30?second (combined) guitar solos. RH then repeated the fifth verse after which the song’s tempo slowed down even further as RH sang the third chorus. Toward the end of the third chorus BJ’s solid drumming escalated the tempo to its initial pace. 9. Never Satisfied (Judas Priest cover: Rocka Rolla, 1974) is a brooding Judas Priest classic that featured MC and RR’s catchy trudging guitar chord progressions. RH smiled at RR and sang the first two verses in an atmospheric tone and at a slightly lower than usual octave, “Where do we go from here. There must be something near. Changing you, changing me forever. (verse transition) Places change, faces change. Life is so very strange. Changing time, changing rhyme together.” The third verse was separated from the second by a 30?second interlude that featured MC and RR’s ascending guitar chords followed by their catchy guitar chord progressions from the song’s introduction. During this interlude RH walked to the front edge of stage left where he shook and slapped hands with front row fans. RH then sang the first chorus after which he pointed at RR as the cue for him to go center stage where he played an extended 140?second guitar solo on his maroon Gibson explorer guitar while RH was off stage. RR demonstrated his dexterity by beginning his solo with left?hand vibrato and hammer ons on the fretboard of his raised guitar. RR played 15 seconds of his solo with his back to the crowd and his guitar propped on the back of his neck while he continued to play. RR swiftly turned 180 degrees, repositioned his guitar in front of his chest, and extended it forward where he used his mike stand to play five seconds of his solo. At a couple of points during his solo RR brought his right thumb and forefinger adjoined at the tips to his lips. [RR was either requesting a straw or encouraging marijuana smoking.] RR wore black tennis shoes, black leather slacks, black cotton muscle button?down shirt. MC played guitar riffs with a quasi country tinge during RR’s guitar solo. RH came back on stage and sang the fourth verse after which MC and RR played the catchy trudging guitar chord progressions from the song’s introduction at an ever?decreasing tempo until the end of the song when RH sang the second and final chorus. I did not understand RH’s logic in overlooking the Priest catalog. Granted the band performed Never Satisfied, an obscure song off Priest’s first record (Rocka Rolla, 1974). I am not the type of fan that throws a hissy fit because a band does not play a particular song and protest that the oversight had cataclysmic repercussions. RH’s catalog with Priest, Halford, 2wo, and Fight (heavy metal band fronted by RH during his temporary departure from Priest that released two records, War of Words (1993) and A Small Deadly Space (1995)) is too expansive to be so narrow?minded. However, RH does not have to posses Warren Buffet’s (American billionaire investor) business acumen to know the majority of Halford fans would be pleased and willing to invest their hard?earned money in a down economy ($40 face value per ticket for this show) for a future Halford show if the band played at least three Priest classics. 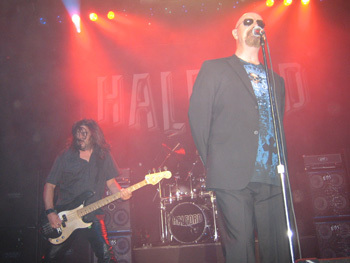 I am aware the show was a Halford show, not a Priest show. Regardless, RH is and forever will be the face of Priest. If anyone has doubts compare the attendance for Priest concerts in the Bay Area when fronted by RH as compared to Tim “Ripper” Owens (Judas Priest vocalist 1996-2003). 11. Saviour (Resurrection, 2000) is a stripped down, fairly up tempo song. RH sang the first verse with a menacing tone augmented by MC and RR’s ominous guitar riffs. RH stretched out the last word of each verse line, “I’m set to paralyze. I’m older so I’m wise. I have been crucified. With words personified.” RH then sang the first chorus at a slightly higher octave and in a melodic tone. RR then played searing guitar notes on his black Gibson flying V guitar for 10 seconds after which RH repeated the pattern from the first verse and chorus when he sang the second verse and chorus. MC then played a 30?second guitar solo on his black Jackson flying V guitar followed by the third chorus. After the song concluded RH said, “I love you all San Francisco. Thanks so much. It’s been real. Thank you.” At the same time RR walked to the front edge of stage right where he extended the headstock of his guitar to the front row fans. RH raised both his hands and took a bow. The band left the stage at 11:07 and returned in less than one minute to play two additional songs. 12. Crystal (Crucible, 2002). Before Crystal RH said, “Thank you for supporting us.” Crystal is a fairly slow tempo song that began with and was driven by MC and RR’s ominous guitar chord progressions, BJ’s cymbal hits, and MD’s heavy bass lines. [MC and RR played a guitar chord progressions suited to raise the dead from the grave and make it writhe in agony.] Before the first verse RH thrice repeated the phrase, “aah … aah … aah” in an atmospheric tone. RH then sang the first two verses while MC and RR played light, mid tempo, palm?muted guitar chords in the background along with BJ’s basic drum beats, “Smell your world when you come. I won’t make a victim. I lie awake and I’m forsaken. (verse transition) From all the holes in my time. You saved up for this true lie. The devil bides her time in waiting.” RH then sang the first chorus that served as the impetus for MC and RR to once again play the ominous guitar chord progressions from the introduction for 30 seconds. The band repeated the above pattern for the third and fourth verses and second chorus. RH then sang the fifth verse during which the guitars and drums were barely audible followed by RR’s 30?second guitar solo, part of which he played with his black Gibson flying V guitar nestled on his left thigh. RH then repeated the third chorus four times during which he took a few steps forward and backward and left and right while he extended his hands out as if balancing on a tightrope. Crystal, Golgotha, and Resurrection received the strongest audience reaction. 13. Rock the World Forever (Crucible, 2002) like Never Again, presented a dichotomy. 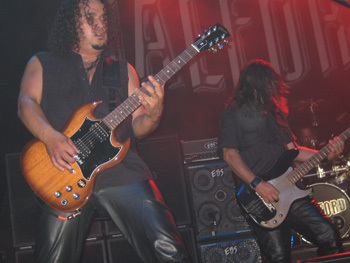 The introduction featured MC and RR’s up tempo, choppy guitar riffs in the thrash vein reminiscent of songs on Slayer’s Diabolus in Musica record (1998). As RH began to sing the first verse MC and RR slightly modified their playing to feature chugging guitar chord progressions, albeit still heavy. Rock the World Forever, like Never Again, presented a dichotomy in the form of the first chorus when RH sang, “Rock the world forever. You know you’re the one. Rock the world together. We will carry on.” While MC and RR continued to play heavy guitar chord progressions RH sang in an overly melodic manner that did not mesh with the guitar chords. It sounded like an ill?fated attempt to combine Slayer’s Stain of Mind off the Diabolus in Musica record (1998) with Judas Priest’s Living After Midnight off the British Steel record (1980). When RH sang the final line of the first chorus MC and RR resumed playing the choppy guitar riffs from the introduction, which they continued to play while RH sang the second verse. RH then sang the second chorus followed by MC and RR’s 15?second (combined) guitar solos. RH then sang the third chorus. At the conclusion of the song RH said, “I enjoyed myself. Thank you so very fu**in’ much. I love you.” At the same time RR once again walked to the front edge of stage right where he extended the headstock of his guitar to the front row fans. RH walked to the front edge of stage left where he shook and slapped hands with front row fans. The house manager did not even wait for RH and his band members to walk off stage before he turned the house lights on. Venue: the building that housed the original RB, known as the Avalon Ballroom, was built in 1911. The Avalon Ballroom operated from 1966 to 1968 and reopened in 2003 under its current name. During the ballroom’s original stint in the 1960’s local bands such as Janis Joplin, Quicksilver Messenger Service, the Steve Miller Band, and Big Brother and the Holding Company performed at this venue. RB is a 1,050­?seat theater with a rectangular?shaped standing room floor measuring 96 by 69 feet with blonde hardwood floors and a permanent stage measuring 42 by 20 feet. Positioned 35 feet above the floor are 22 teardrop chandeliers circa 1900 secured on a roof adorned with gold medallions. RB has a horseshoe-shaped reserved seating balcony, the interior siding of which visible from the floor is virgin white. Four vertical white columns line the wall atop the stage and another six are present on each of the walls on the second floor. Also lining the side walls on each floor are six square?shaped gold?colored tapestries. This entry was posted in Concert Reviews and tagged Hartford. Bookmark the permalink.